We all have cards that don’t necessarily turn out the way we had envisioned or a project that we designed to be feminine that could be made masculine with a few tweaks. Some of you may remember the Recipe Remix Challenge from SAF 2013. It’s sort of like that (but with our own projects instead of customer submitted projects). The idea is to show a project transformed into something fresh and new. Now we want you to give it a go! Take a card you’ve made in the past and transform it in some way. Create a project utilizing your take on the challenge. 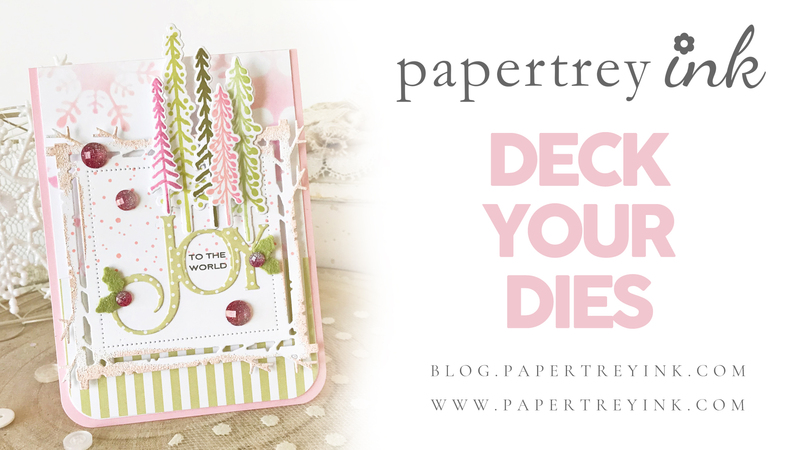 Your project must use at least one Papertrey product and transform a previous card you made into a new project. You will have until 6am ET, Tuesday, December 11th, to add your link to the list to be eligible to win. One randomly selected winner will be chosen from ALL the entries on Tuesday, December 11th, after 6am. The winner will be posted here on this blog post, on Twitter and Facebook. The randomly selected winner will get a $25 PTI gift certificate to spend however they like! Congratulations, Carmela Hubler! Please send an email to customer service and provide them with your full name and the email address you would like your gift certificate sent to. Thanks so much to everyone for playing along! WOW! Both cards are gorgeous! But I love the soft blue tones of the 2nd one the best. So pretty! I like the old card very much but the new one does look fresh. 2 incredible cards, but the new one is awe-inspiring! Love what you created! All so pretty, thanks for sharing.